If you try to pursue happiness, it’ll slip through your fingers. On top of that, your pursuit will often sideline a much more renewable source of positive energy: joy. 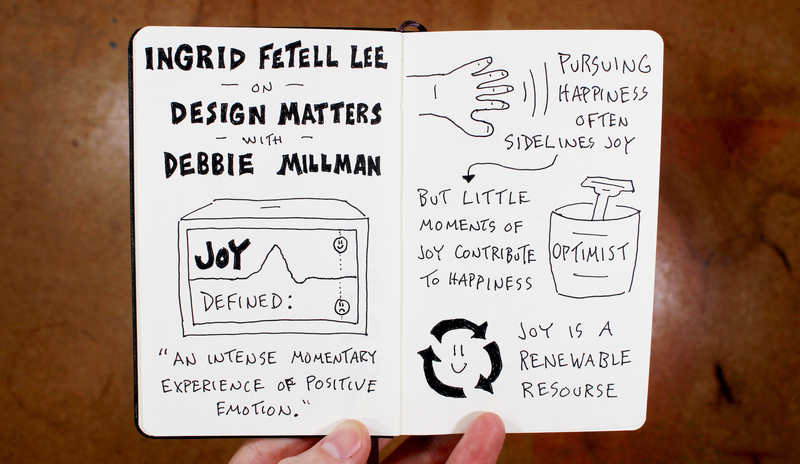 Those are a few of the things that I learned while listening to Debbie Millman‘s interview with Ingrid Fetell Lee on the podcast Design Matters. I’ve shared a handful of my sketchnotes of that conversation below. The definition of joy: an intense momentary experience of positive energy. A great podcast conversation about joy, happiness, and the way our surrounding environment affects us. I appreciate the description of joy as a renewable resource, and the fact that even small and simple objects (like a cup in the shower with the word “optimist” on it) can continue bringing you joy year after year. If you’re feeling stagnant, better to go on a walk than to try to “fix” your stagnancy from within. The benefit of spending time in nature and how joy is connected to sadness. I happened to be walking up Mount Tabor in Portland, Oregon while listening to this podcast. That’s a weekly ritual for me, and without fail it brings with it a shift in perspective and a renewed sense of optimism. But it’s easy to forget that role that nature can play, and to put pressure on ourselves to generate new momentum from within. I’m glad that I have a reminder that that’s not necessary. In my home office I’ve got a window just to the left of my desk. I turn to it regularly, even now while writing this post. Students with ADHD do better in classrooms with windows – the passive stimulation of nature helps maintain concentration. That term passive stimulation feels so spot on. The view out of my office window is engaging but not distracting, complex but also calming, and the writing of this post would have been more painful without it. I’m excited to pick up Lee’s book Joyful. It’s easy for me to take my life and my work too seriously, so I’m game for anything that will help me make some shifts in the direction of joy. 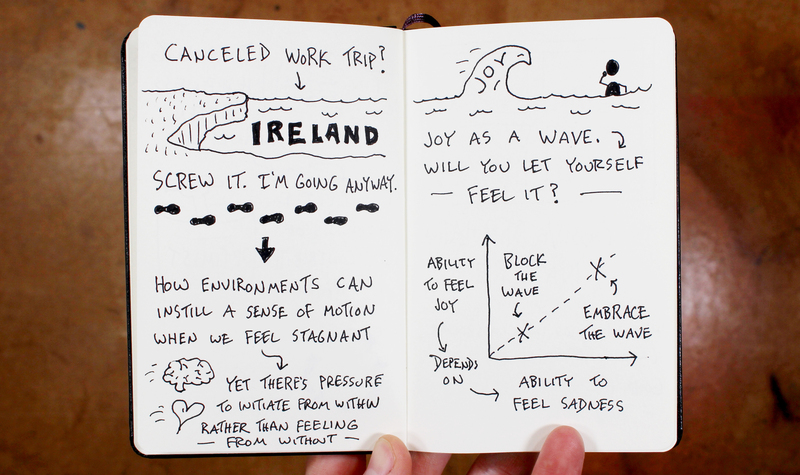 You can check out the show notes for that video in this post: On-the-Go Podcast Sketchnoting. 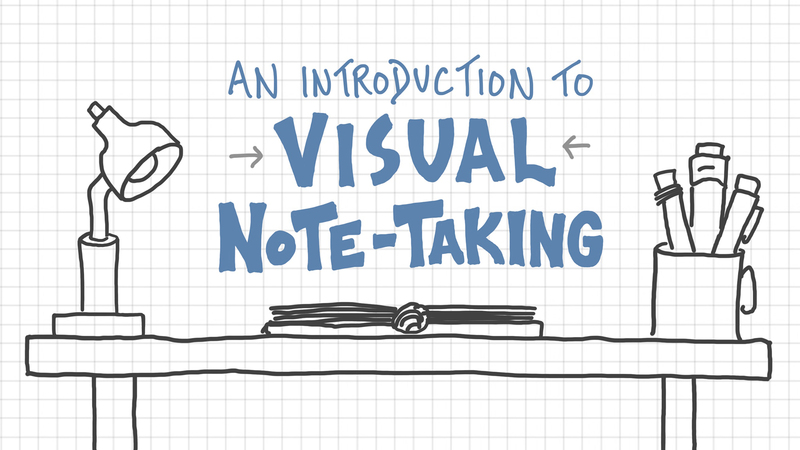 If you’d like a deeper dive into the development your sketchnoting skills, then check out our course An Introduction To Visual Note-Taking. To build your own sketchnoting skills, check out our introductory course! You can explore our full course library here.